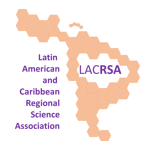 The Latin America Regional Science Association (LARSA) represents the affiliated and common interests of the various regional science organizations of the countries in Latin America and the Caribbean. LARSA operates as an objective, scientific body without political, social, financial, or nationalistic bias. It supports its objectives by promoting acquaintance and discussion among regional scientists and with scholars in related fields, by encouraging the publication of scholarly studies, and by performing services to aid the advancement of the field of regional science. LARSA serves as the organizational body representative of the interests of its institutional and individual members with respect to the Regional Science Association International (RSAI). It affiliates sub-national, national or regional sections of the Regional Science Association International located on Latin America and the Caribbean. The sections are institutional members of LARSA and their individual associates are members of RSAI. Institutional members can simultaneously be members of other supra national associations.